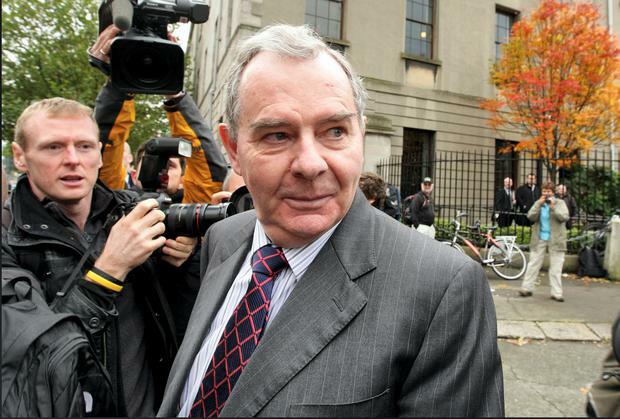 THE financially fatal entanglement between one-time business tycoon Sean Quinn and Anglo Irish Bank is probably the single greatest fiasco in Irish business history. Sean Quinn's massive and secretive bet on Anglo Irish Bank shares ended up destroying the fortune he had built up over decades. Before his disastrous punt on the bank, he had been able to boast that each of his five adult children was a billionaire. The origins of the Quinn wealth had nothing to do with banking, it was rooted in manufacturing and other business built up along the Border over decades. But by September 2007, the businessman had quietly amassed a 24pc stake in Anglo Irish Bank, investing through so-called contracts for difference (CFDs), risky debt-funded punts. Using CFDs meant the holding did not have to be declared, and allowed Sean Quinn to borrow to buy shares with a relatively small amounts of money down. Senior figures at Anglo Irish Bank have described the shock at learning of the stake – which was disclosed at a meeting between Mr Quinn and his top manager Liam McCaffrey, as well as Anglo's then chief executive David Drumm and then chairman Sean FitzPatrick. The meeting at the Ardboyne Hotel in Cavan has become the stuff of legends. Mr Quinn confirmed that he was a major shareholder – but from the bank's point of view, his 24pc stake was seen as dangerously big. It meant Anglo was vulnerable if anything happened to Sean Quinn's wealth. The stake was massive. At the peak in May 2007, the bank had a stock market valuation of €12bn. In less than two years that value would be wiped out, sweeping Mr Quinn's investment away with it and eventually leaving the businessman bankrupt and locked with the bank in a mesh of bitter legal cases. As long as the share price had been rising, however, Sean Quinn had been sitting pretty, but as it fell in late 2007 and throughout 2008 – partly on rumours about the size of his own stake, his finances were hit hard. Using CFDs meant Quinn had borrowed to buy his shares, as they fell in value he was still on the hook for the loans, and had to make up the shortfall in share values to prevent his CFD providers calling in the deals entirely. For the bank, that would have meant a flood of shares coming on the market – driving down prices even faster than was already happening. As we have learnt since, the bank effectively secured a mortgage over the Quinn Group as it increased its lending to Mr Quinn. This hurt the once mighty Quinn Group, dragging the business as the third party in the fatal embrace, and locking Quinn and Anglo more deeply into their financial death embrace.